Assuming you don’t work on a deserted island, your coworkers are talking about this year’s NCAA Men’s Basketball Tournament. Aptly nicknamed “March Madness,” the annual 68-team competition captivates Americans’ attention like few other events, sporting or otherwise. This is partially because of the excitement on the court, but mostly because of what’s riding on the outcome: inter-office prestige and, more often than not, money. Upwards of 47 million Americans will place some kind of wager on the outcomes of this year’s tournament. That will amount to nearly $8.5 billion in total bets, most of which comes through office betting pools. 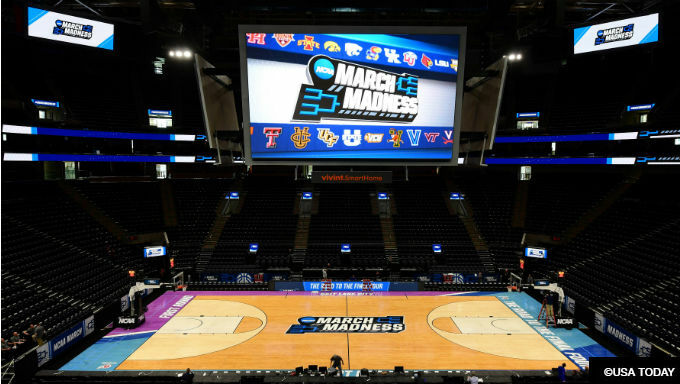 Here’s what you need to know about pool betting for the 2019 NCAA Tournament before one of your coworkers comes to ask you for your bracket – and entry fee. What is Office Pool Betting? Pool betting is when a group of players gather their wagers into a collective pot with the winner or winners taking only from the total amount wagered. This is a variant of pari-mutuel betting, which in America is most popularly associated with horse racing. In both systems, there is a set amount of money a winner can take home. For example, let’s assume you’re in a 10-person pool with a $10 entry fee. In a winner-take-all scenario, the top player would take home $100. This is in contrast to traditional sports betting, where players wager on the outcome of an event against a gaming purveyor. If the bettor wins, they get their initial wager back plus the payout, which depends on the odds set on the event’s outcome when the bet was placed. The bet taker may also charge a certain fee on the wager. Comparatively, pool betting makes joining a bracket competition with your coworkers much easier for tracking and participation. How do I Play in an Office Pool? Almost all March Madness bettors fill out a bracket listing current and potential matchups during the three-week long tournament, which ends the first weekend of April with the Final Four. Players pick their selections for first-round games, then based off those picks choose their second-round winners and so on, until one champion remains. How a pool player is measured against their competitors varies depending on groups. Some scoring systems reward one “point” for each correct pick. The player with the most correct picks takes home the pot. More frequently, points are weighted depending on the round. For example, a player may earn one “point” for each first-round pick correct, two for each second and so on. There are multiple other variations of play, so ask your pool administrator before filling out a bracket. Office pool betting is only explicitly legal in 13 states. If you are in the other 37, you aren’t necessarily protected by law. You would assume that nearly 50 million Americans wouldn’t flaunt participation in an illegal activity every year but, as with most aspects of American gambling, questions over the legality of March Madness pool betting are never simple. That’s because sports betting in most forms is still illegal. The bigger question is what constitutes gambling. Most laws prohibit games of chance, but will permit games of skill (this explains why most states allow daily fantasy games). That begs the question on NCAA Tournament predictions. Some would argue it’s a contest of skill, as players use background knowledge and information to make conjectures on the future. Others would argue it’s a game of luck, which as we’ll see later is a stance backed by the typically unpredictable nature of the tournament. Those questions are still undetermined in most jurisdictions, leaving the legality of pool betting in legal limbo. Until lawmakers explicitly change laws to permit the practice, most offices are technically placing illegal sports bets. What About the Supreme Court Decision on PASPA? You may have heard about last year’s Supreme Court decision to strike down the Professional and Amateur Sports Protection Act, or PASPA, which was the federal prohibition on sports betting. In the past year, seven states have joined Nevada among those with legal wagering, and a host of major media companies have launched sports gambling programming. That doesn’t mean you can place a bet where you live. The court merely removed the overarching ban on sports betting at a nationwide level: that doesn’t mean it legalized the practice in all 50 states. Until the ban’s removal, states couldn’t pass sports betting legalization bills. New Jersey, hoping to approve sports betting in the early 2010’s, legally challenged the ban, and the Supreme Court ultimately ruled the federal ban violated the 10th amendment of the constitution. New Jersey was taking bets a few weeks after the ruling, and several other states followed shortly thereafter. But as of this year’s tournament, 42 states still don’t have sports betting. More than two dozen additional states have introduced legislation to take legal bets, but legalization has been a slow and often fruitless process in most locals. In the meantime, sports betting remains illegal for most of the country. ”Sports betting legalization” in of itself may also not be enough to legalize your office pool. Lawmakers have tended to only permit regulated casinos or horse tracks to take bets, largely ignoring small-level pool betting. If the slow process to permit just this form of sports betting is any indication, it may be a while until a legalization bill is passed. Can I get in trouble for pool betting? In short, probably not. Police officers likely won’t bust into your office to confiscate bracket sheets and petty cash. That doesn’t mean your immune from legal liability – especially if you’re the one collecting entry fees. Pool operators that collect money from players or in any way communicate information about their office pool may run afoul of the Interstate Wire Act of 1961. Designed to combat mob activity decades ago, the law has nevertheless been interpreted to cover phone and online communications. This is further reinforced by the Unlawful Internet Gambling Enforcement Act of 2006, which had been used to shut down the U.S. online poker market. Since nearly all modern office pools now use the internet, it makes it difficult to see how pool operators aren’t technically breaking these laws. The participants, by extension, could theoretically also be complicit. Still, enforcement on such a small scale is incredibly rare. A New Jersey man garnered headlines in 2015 when officials arrested him for running a betting pool, but he had more than 8,000 participants across the globe and close to $1 million in the pot. This is a rare scenario of pool betting on a massive, international scale – and an even rarer instance of a crackdown. Authorities aren’t inclined to thwart a few hundred dollars changing hands among coworkers. Plus there are literally hundreds of thousands of offices organizing these pools, meaning cracking down on all of them would be impossible. Even the NCAA, the ostensible non-profit organizer of the tournament promotes bracket play. Without publicly promoting money exchanging hands in office pools, the NCAA realizes it means more attention on their product, which ultimately means more advertising potential and, most importantly, more revenue for the organization. When Does the Tournament Start? If you aren’t scared off by the legal questions, which you shouldn't be, you’re about to enter one of the most exciting times of the year in the American office place. The first game of the 67-game competition tips off at noon EST on Thursday, March 21. That starts a marathon of 16 games spread over the course of 12 hours, each with millions of brackets riding on the outcome. Friday the 22nd features a second-straight day of 12-hour, 16-game marathons. It’s no surprise that workers’ attentions are often distracted during that time. Media outlets love to run annual stories announcing lost productivity totals during these two days. This year’s batch of posts project 2019 NCAA Tournament will cost more than $600 billion from workers eschewing their jobs to follow the outcome of an amateur basketball competition. What are the Odds I Win My Pool? Obviously that depends on the makeup of your pool, but more significantly it typically comes down to luck. March Madness earned its moniker because of its predictable unpredictability. Year after year, the tournament serves shocking upsets, wild finishes and millions upon millions of busted brackets. All participating teams are divided into one of four “regions” and then seeded one through 16 with the best teams seeded No. 1 and the worst at No. 16. This arrangement creates 9.2 quintillion possible ways to fill out a complete bracket. Even taking into account seeding, team strength and insider knowledge, there’s less than a one in several billion chance you can take home a perfect bracket. Of the millions introduced each year over the past decade, no player has come close to perfection. So clearly perfection isn’t a realistic possibly among your friends or colleagues, but even selecting half the correct outcomes is daunting. The NCAA reports that winning entries submitted to its bracket challenge competition pick only 49.8 percent of correct outcomes. So there’s no lock of any tournament, even if you’re taking chalk. What Does Taking Chalk Mean? ”Taking chalk” or “picking chalk” is an old gambling expression that means selecting the favorite. A pool player with mostly favored higher seeds over lower seeds could be said to be “taking mostly chalk” in their bracket. This term comes up frequently around March Madness because most players will take favorites even though underdogs have a long history of upsets. Lower, double-digit seeds have won at least one game In the majority of tournaments since the field expanded to 64 teams in 1985. Upsets in all seed pairing have occurred at least once. Last year No. 16 seed University of Maryland Baltimore County ruined more than 99 percent of brackets by taking down No. 1 seed Virginia. That was the latest reminder that any outcome can happen in almost any game. Which Team Will Win the 2019 NCAA Tournament? If you haven’t figured by now, your guess is about as good as anybody’s. Some pool players select winners based off school name or mascot or even colors, regardless of the team’s talent or record. Others study teams all season, the base their choices off statistics, strengths and weaknesses. Often times each strategy proves equally effective (or ineffective). 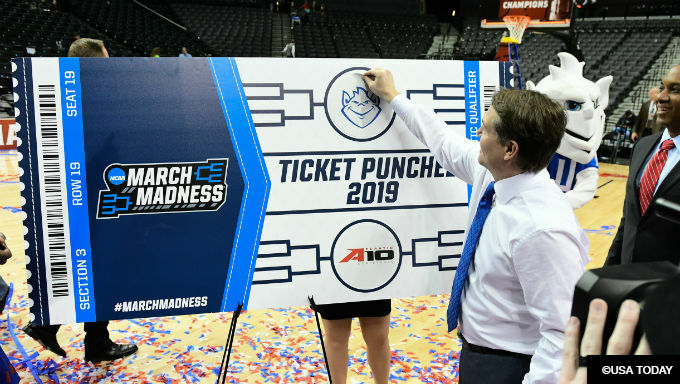 If you want to base this year’s picks of history, top regular-season teams like Duke, Virginia, Gonzaga and North Carolina have all earned top seeds in the bracket cap off the list of favorites. Others just behind the leaders including Michigan State, Tennessee, Kentucky and Michigan have combined with the top seeds as the squads most selected by players to win. That doesn’t mean they’re a sure bet. Since 1979, No. 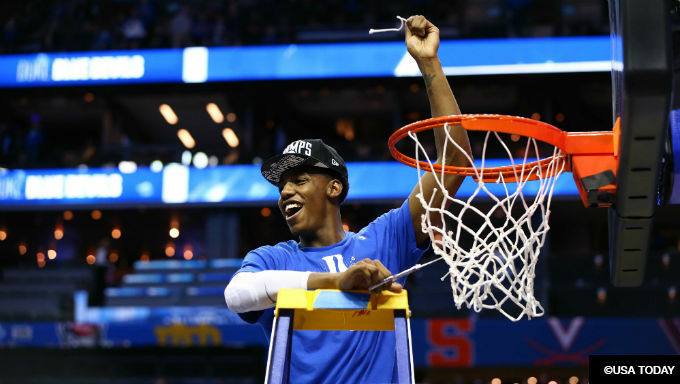 1 seeds have made about 40 percent of all Final Four appearances, No. 2 seeds have made about 20 percent and No. 3 seeds about 11 percent. But around 25 percent of teams seeded between four and 11 end up in the final four, meaning a high seed is no guarantee of a deep run. But that’s part of the fun. Every year seems to bring a new string of upsets and storylines, reinforcing America’s addiction to basketball madness that comes each March. It’s no surprise this has translated to interest in betting pools.